There have been tons of buzz about election anxiety cropping up in the days before this election, and for good reason. One mental health counselor in Seattle told a local TV station KING that 85 percent of the people who have sought out her help for the first time were suffering from election-related issues. Now that we're down to the wire, maybe you're like me and couldn't sleep all that well Monday night. 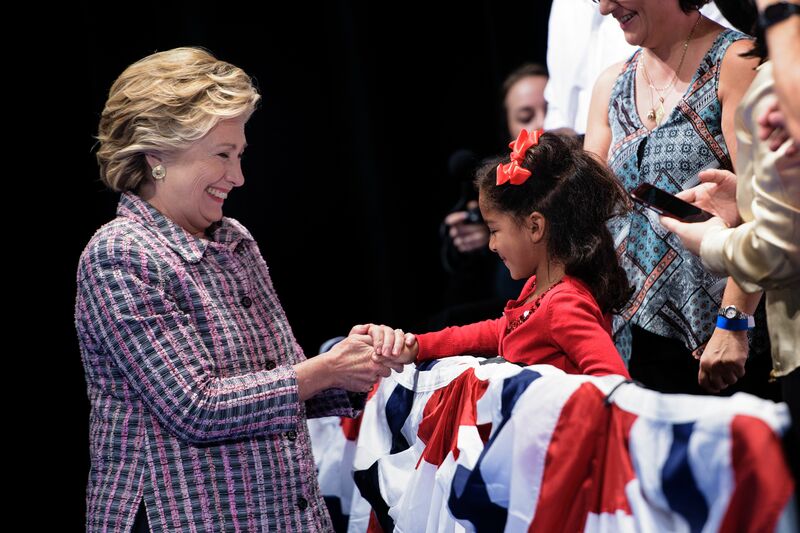 Well, then, you're going to love how this little girl made it through the night before the election: she went to bed with a Hillary Clinton action figure. That's right — and it's the cutest thing ever. Sara Spruch-Feiner, a writer based in New York City, tweeted out a photo of her young cousin curled up in bed with a six-inch tall, plastic HRC. Now if that's not the best way to get a good night's sleep before Clinton goes up against Donald Trump at the ballot box, I don't know what is. When boiled down to a plastic toy, Clinton seems to take on a super hero quality. She's there to fight for you. That big smile on the doll will be the same one on stage as she celebrates her victory Tuesday night, and you can't help but imagine how positive seeing that will be for young girls (and boys) across the country. The action figures were designed by Brooklyn-based design firm FCTRY, and was initially funded with a Kickstarter. Now you can buy your own power suit and pearls Clinton on Amazon for just $19.99. On their original funding pitch, FCTRY explained, "We started with one goal; to make Hillary Clinton into an awesome iconic action figure. Basically, we’re hoping to kick off some light-hearted excitement about her campaign and the amazingly cool prospect of America getting its first woman president." At least for this little girl, it worked. If you don't think that will fix your election stress — or it's not available from Amazon Prime Now in your area, find some other way to focus on the badass woman that Clinton is. Don't let election stress, rob you of enjoying this moment. Focus on the good. Whether it's abortion rights, the pay gap, or paid family leave, her presidency will be great policy-wise for women. But it's way more than that. The country's on the verge of making history again. So take on election day with your version of the action figure: pride in your candidate.